"Abide in me, and I in you. As the branch cannot bear fruit of itself, except it abide in the vine; no more can ye, except ye abide in me. 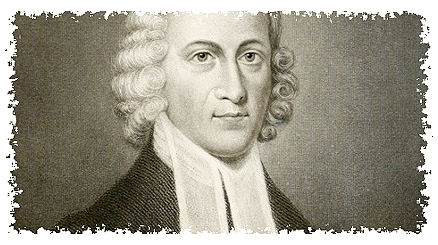 In a previous post, we looked to the seventy Resolutions of Jonathan Edwards as an example of an eternal and God-glorifying perspective that all believers ought to emulate. They are an especially helpful reminder at the beginning of a new year, when everyone is thinking about the resolutions they will make for the upcoming weeks and months. But let’s be honest. A list of spiritual goals compiled by one of church history’s greatest heroes can be a bit intimidating, especially when there are seventy of them. When we make similar resolutions — and later fail to keep them — it can be downright discouraging to compare ourselves to someone like Jonathan Edwards. Well, here’s a nugget of encouragement for you. Even a notable Puritan theologian like Edwards struggled to keep his resolutions. The last week I was sunk so low, that I fear it will be a long time before I am recovered. I fell exceedingly low in the weekly account [regarding keeping my resolutions]. I find my heart so deceitful, that I am almost discouraged from making any more resolutions. — Wherein have I been negligent in the week past; and how could I have done better, to help the dreadful low estate in which I am sunk? Like all believers, Jonathan Edwards experienced times of temptation, defeat, and discouragement. His ongoing fight against the flesh is reminiscent of the struggle Paul described in Romans 7. Edwards’s battle resonates with us because we wage that same war each and every day. So, how did he overcome those times? Even after periods of failure and fatigue, what was the key to renewing his resolve? The answer is as simple as it is profound. 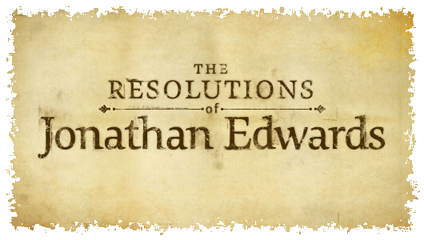 Jonathan Edwards realized that his resolutions failed when he tried to accomplish them in his own strength. They could not succeed unless he relied on God’s grace and the power of the Holy Spirit for their accomplishment. In his Diary, Edwards explained that the key to his spiritual vitality was not the mere making of resolutions, but rather a full dependence on the Spirit and grace of God. Here again, Edwards recognized that his sanctification was dependent on Spirit’s power. That perspective is helpful for us to remember, especially in a season full of resolution-making. Yes, we are to discipline ourselves for the purpose of godliness (1 Timothy 4:8 ). That means that to make spiritually-minded, God-glorifying resolutions is a good thing! It also means that the Christian life takes disciplined effort on our part. But we need to remember that, while we are to work out our salvation with fear and trembling, it is God who is working in us to accomplish His perfecting purposes (Philippians 2:12–13 ). Unless we rest in His grace and walk in His power, we are doomed to discouragement and defeat. When we are led by the Spirit, prayerfully submitting ourselves to His Word, we can be confident that God is molding us into the image of His Son. In that context, making and keeping resolutions is a wonderful part of the spiritual disciplines of the Christian life. But when we try to better ourselves in our own strength, we will inevitably experience frustration and failure no matter how many resolutions we make. None other than Jonathan Edwards knew that to be true. * This article was originally published on January 5, 2012.